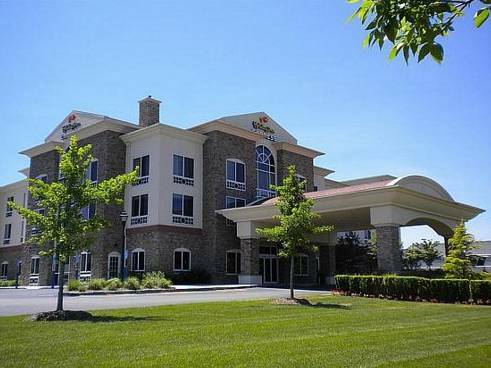 Enjoy Riverhead Hotel's Convenient Long Island Location Situated in the heart of Long Island's North Fork, the Holiday Inn Express Hotel East End offers travelers quality accommodations and impeccable service. Minutes from the Long Island Expressway, this Riverhead hotel's location is ideal for business trips and family vacations alike. Amenities like free wired and Wi-Fi access and a 24-hour business center make this hotel a top choice among Long Island business travelers. The hotel's four meeting rooms are suitable for groups of up to 50, and patrons appreciate the convenient access to such companies as Tanger Outlet Center and Brookhaven National Laboratory. Whatever your interests, the hotel's location in Riverhead, New York gets you in the center of the area's best attractions. At Atlantis Marine World, visitors get an up-close look at native marine life, including river otters, sea lions and sharks. In the summer, you can cool off with exciting water rides at Splish Splash Water Park. Of-age visitors can also check out more than 30 wineries throughout Long Island. Experience the utmost in comfort during your trip to Long Island with this hotel's outstanding amenities, from a 24-hour fitness center. We offer complimentary shuttle to and from our sister property, Hotel Indigo for use of their amenities such as Bistro 72 Restaurant and Lounge, onsite Spa and outdoor Fireplace. Over 165 Brand Name Outlet stores only .25 miles from the hotel. Tangers hours change seasonally so please make sure to contact them for their current hours of operation. Features mini-golf, batting cages, water wars, the Hippo inflatable waterslide, and jump shot basketball. Visit outeastfamilyfun.com for more information and coupons. Open seasonally.